Today I established that I have not checked my email since 17 March. To save you from doing the maths, that means every email I have been sent has languished, unread, for potentially 5 weeks or 35 days. Impressive? Very. Normally it takes me much longer than that to check my emails. It isn’t that I hate email as such, but I am not a fan of what it has become. In the first 2 minutes of logging into my account, I had deleted 96 emails, 94 of which are still marked as unread. For my confused friends out there, this means I accidentally opened two of them. These 96 emails are in addition to my junk mail folder, which currently contains 74 emails from the past week, and a folder I filter all my newsletters into, which contains an additional 442 emails that I probably won’t open before I delete them. Congratulations Catherine, you’ve been selected as a VIP! Hurry, Catherine! Your Coupons END MIDNIGHT TONIGHT! Wil Wheaton retweeted a photo from Anne Wheaton on Twitter! Imagine that … a man retweeing a photo his wife put on Twitter. If I didn’t have five other emails from Twitter telling me what else Wil Wheaton has been getting up to, the shock of this might have killed me. Most of my social media accounts have very strict email settings selected. In the past month, Facebook has clearly decided to ignore these. Twitter now sends me more emails than LinkedIn, and LinkedIn is the only one where I haven’t set as many restrictions as I can find. Add to this the sheer number of businesses who are so desperate for my money that they email me multiple times every single day, and there isn’t much point in being diligent with checking. I was recently reading a book that mentioned how important it is to resist checking emails when you have a tiny child who needs your attention. The author wrote that he understands the lure, but that this time in your child’s life will be more memorable than the emails that can wait until tomorrow. This concept left me flummoxed. You could have an adorable little person in front of you, thrilled that the centre of their universe is at home with them, and a chime from an email account could interrupt that? How does that even work? Hi. Thanks for your email. I probably won’t read it. My spam filters aren’t ruthless or anything like that, it’s just that I probably won’t even realise it’s there. I’m not really into checking my emails, but I appreciate the time you took to compose it. Or, if your email is amongst the 99.9% I get, I appreciate the time it took you to do a mail merge. Did you know that, by age 14, 1 in 10 children apparently has a diagnosable mental health disorder? That number rises to 1 in 5 people by the age of 24. Our world is going somewhere scary, and if you genuinely think I should respond to your email within 2 hours, then quite frankly you’re part of that problem. I’m trying to make the switch from online avatar back to flesh and blood person, and it’s a good change. Try it out some time. If you really want to talk to me, you could try actually talking to me. I know you won’t, but I wanted to give us both a good laugh with that statement. Email the boyfriend if it’s urgent and you don’t remember how to use a phone. I won’t stretch your sense of imagination by suggesting you come by my house or meet me for a coffee; that would be too old school by far. As I hit the save button, I broke out in giggles. I wonder how many websites will paste this message as my formal reply to status updates and photo uploads. The past week has been so hot that my sleeping and working schedule has vanished. I have been unable to concentrate during the worst of the heat, so I have tried to use that time to sleep. This means that I am awake when it is cool enough to think, but tired from bad sleep. Welcome to summer in Australia. This is the first true summer I will spend in Canberra. On the plus side, the nights are quite cool here, so we do have a few hours of relief. On the down side, I am hopelessly unprepared for the worst of what summer might bring. In Melbourne, I always had a plan for the fire season. The fire warning websites were bookmarked on my computer, and I would check them daily so that if danger approached I would have a fair warning. The plan was to bundle the animals into the car and take them somewhere safe. For a city that wraps around a bay, this is a fairly easy plan to follow. Now that I am in Canberra, my plan is useless. Fleeing to the beach would take three hours instead of ten minutes. I do not know where the safe places to hide are in this city; Canberra has previously been ravaged by bushfire in a way that my home in Melbourne was protected from. It is also an inland city, which means there is potential for us to be ringed in by fire. When I wake up in the morning, I quickly glance out the window and see if there is smoke in the sky. I taste the air when I walk outside. If our neighbours are smoking outside, I feel a brief flutter of anxiety. The threat is real; one only needs to look at how much of Tasmania is already burning to know that we are in for a bad season. Our plan is to flee if a fire comes close. A rental property is certainly not worth my health and safety, nor that of my partner. With that decision made, we are then faced with all the possibilities to plan for. If the call to evacuate comes while my partner is at work, does he return home first or do I collect him on my way out? What do we save? What do we abandon without a second thought? We have decided to keep the petrol tanks in the cars full; I do not want to stop for petrol with a fire raging 5km away. My partner has pruned the trees that overhang our roof, so that if they catch on fire they will not drop burning branches onto the building. We keep chilled water in the fridge so that we have something to take with us if we need it in a hurry. Do I feel prepared? No, but this is better than nothing, and it is as good a place to start as any. Am I overreacting? It is impossible to say; tomorrow has an Extreme Fire Danger rating, and several fires are already burning in the area. I would prefer to overreact and feel foolish than to minimise the threat in my mind and be caught by it. Last week I wrote a recap of the goals I wanted to achieve before my 30th birthday. I’m pleased with the results, but my birthday is also when I set my new year resolutions. By setting them now, in early December, I give myself a few weeks to plan how I will do things before the new calendar year starts. I can practice trying to form the habit, and quietly hide any early failures and restarts from other people. Obviously, this blog post is my potentially humiliating way of destroying that little cheat. I decided that 30 is going to be an ambitious year for me. While I accomplished the goals I had for my 20s, they were also disrupted repeatedly by my misguided belief that other people were automatically correct about my limitations. Some of my goals were revised in ways that ultimately proved to be unhelpful, and I carry a lot of regret about not listening to my own instincts. After a lot of reflection, I have decided that I would rather fail at one goal but succeed at twenty than fail at nothing but only succeed at two things. Tell anyone who belittles my dreams where to go. I can demoralise myself perfectly well without assistance from negative people. Submit a novel to a publisher or an agent. I would have said get it accepted but, given some of the delays in publishing, that would be unrealistic. Finish writing two full length books. “Finish” is a keyword here; I consider finished to be as polished as I can make it with the help of my beta readers and editors, not just a first draft. Regain the physical strength I had in my early 20s. Given where I was two years ago, I am about half way to achieving this goal, which sounds like a great time to step it up. Balance my budget. This was impossible to do for a long time due to the sheer number of medical expenses I had, but those days are hopefully behind me now. Wear pretty things. I spend a lot of my time home alone or at the gym, and the beautiful clothes in my wardrobe rarely see the light of day. I used to dress up for myself, and it’s a habit I want to resume. There are other goals forming in my mind, but many of them are goals for my 35th or 40th birthdays. Some of the goals for my 31st birthday are stepping stones to achieving the bigger vision, but I am happy with them as goals in their own right. Now to figure out how to turn all of that into reality. Earlier this year I began contemplating my 30th birthday, and wrote a list of the achievements I wanted to accomplish before my decade was over. Since I am constantly being reminded of rumours that this event occurs this week, I have decided to revisit how close I came. Feel confident and in control of my financial destiny. For my second language, learning German was a natural choice. My boyfriend is German, and most of his family do not speak English. Regular readers will know some of the challenges and struggles I have had with this over the past year. My skills have increased dramatically. I still wouldn’t say I am fluent, but I am happy to say that I speak the language. There are a lot of insults that I can deliver flawlessly, and my jokes finally became funny. Small talk is good enough for me, and I can do that. Starting a family truly did not work out the way I had expected. When I wrote the initial post, I had made a joke that I would need to get pregnant the following week if I wanted to beat the birthday deadline. Ironically, that is exactly what I ended up doing. Long time readers will know that the pregnancy did not result in a healthy birth, which was devastating for my boyfriend and I at the time. However, I can’t help noticing that I had framed the goal as “become a mother”. I had heard that women become mothers the day they learn they are pregnant, and that was true for me. For those few months I was someone’s mother, so I think I achieved this goal as well as I was able to. Publishing has been a journey, and the intervening months have not been as expected on that front either. I finally decided to adopt a broader view of publishing success, and I have taken steps in that direction. Several of my short stories have either been published or accepted by multiple publishers. I have begun discussing a particular book with another publisher, who is interested in the project. I have not achieved the dream in its original form, but I have read acceptance letters, opened books to see my writing inside, and found multiple paths that I can follow. I have published over 100,000 words this year, and I am proud of my work. I had expected 30 to be a harder birthday than it has been. For many people it appears to be a milestone where they realise what their life isn’t; for me, it has been a milestone where I realise what my life is. Every achievement on these lists is something that I have had to work hard for, and I am proud of myself for doing it. This week I can bid a fond farewell to my 20s. Some bits were great, some bits sucked beyond belief, but they were an incredible ride. I love reading the spam messages that come through to my blogs. Spammers are desperate to get their comments approved, so they spread the compliments thick and fast. I can understand their logic, because who doesn’t want everyone to know how great their work is? It’s validation, and they count on us wanting to prove our worth by publishing their message. I needed to draft you that very small remark to help say thanks a lot yet again considering the extraordinary information you have shared here. It is really shockingly open-handed with people like you to give easily what many of us would have offered for sale for an ebook to help with making some profit on their own, chiefly seeing that you might have tried it if you decided. The concepts also served like a fantastic way to be aware that some people have a similar passion just like my personal own to figure out a good deal more pertaining to this condition. I think there are lots of more fun instances up front for people who start reading your blog post. I had no idea my post about the orange balloon in my living room was so powerful. When I wrote it, I was sure it would be seen as a small piece of amusing fluff. But extraordinary? Gosh. There’s a lot of insanity in my head, and I had no idea that I should be charging people to share it with me. What’s the going rate for nonthreatening crazy these days? This brave little computer has shown me that I am not alone with my orange balloon fixation. There are others out there who also don’t know what to do with balloons once the party is over. Does insanity work in the same way as burdens? An insanity shared is an insanity halved? Or is it an exponential thing, and my mentally unhinged afternoons are expanding into an evil that will allow me to take over the world? Buahaha! It’s a relief to know that my fluff posts are fun. Sometimes I need a break from the serious side of life. Hopefully I can continue to bring you a level of fun that even pleases DVD selling computers. The pen is mightier than the sword. I always took this to mean that words can wound more deeply and for longer than anything physical. Lately I have realised there is more to it than that; words have the power to heal, shelter and love, which the sword can never do. A good friend of mine, Mandi, is the sort of person who goes out of her way for other people. She’s constantly involved in fundraising for various charities, and the amount of effort she puts in is unbelievable. She works at several educational venues as a volunteer, and pours her passion into this work. Whenever her friends have a birthday, she bakes them a cake. She used to work as a baker, so they taste pretty good. For weeks she will find small trinkets to make her friends smile when they open the gift. Making other people feel special is what it’s all about, and she really goes above and beyond to achieve that. What does she get in return? Not a lot. Mandi’s birthday is coming up soon, and it’s one of those significant milestones. This is a very unfortunate time of year to have a birthday. It tends to get lost in between all the other holiday events, such as Thanksgiving and Christmas. Everyone is focused on a long list of errands and seasonal demands. Most of her friends spend her birthday out of town with their families, which means there are few people around to create that special feeling for her. Every year, Mandi would organise her friends around the world to send postcards for her grandmother’s birthday. This tradition has unfortunately stopped with her grandmother’s passing, but today I’m asking you to please help me revive it for Mandi’s birthday. Please buy a postcard and send Mandi a happy birthday wish. You don’t have to say much, just a few words to let her know that there are people in this world who are willing to reach out and care. Together I hope we can help restore the balance of kind deeds performed and returned. 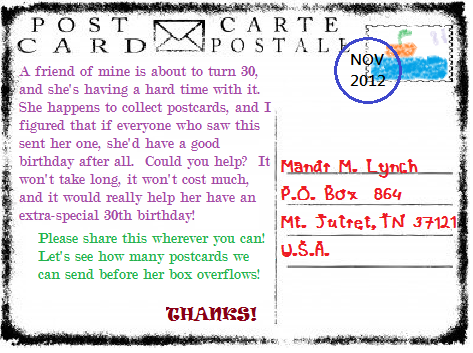 Please send a happy birthday postcard to Mandi at this addres. I’m not very good at interpersonal relationships. They’re based on a lot of small stuff that I simply don’t understand and can’t comprehend. Need a friend to turn to because your boyfriend locked you out of the house, held a knife to the baby’s throat, and you aren’t sure what to do now that the police have taken him away? I’m your woman. Just want someone to sit with you and watch the sun set? I’ll give it a go, but expect me to be confused and uncomfortable the whole time. People need friends like me, and I’m happy to fulfill that role. I’m still in my comfort zone when it’s 3am and I’ve just climbed your fence a few times because I’m trying to work out if you’ve choked to death on your own vomit in the kitchen. Someone else would be frantic with stress and anxiety at that point, but I’m just irritated that you didn’t answer the door and slightly worried about my high heels slipping on the fence palings in the dark. When it’s 3am and I’m coming for you, I won’t bother stopping to find better shoes. My skill is to see light in the darkness, and I’m fairly good at lighting a candle if we have nothing else to see by. I freely hand those candles to the people who need them, and the only thing I ask in return is that they don’t blow out the flame. I stand there and watch as people walk from this cold place of darkness back to their warm brightness, and I rejoice that they have come through this problem and survived. But me? I’m still out there. I never learned how to come in from the cold. Occasionally I stumble back inside, and my bewilderment drives me out again. I know how to be happy when I am surrounded by chaos and destruction. Without a problem that needs to be solved, I can’t figure out what I’m supposed to be doing. I turn into that awkward person who doesn’t know what to do with their hands, constantly fidgeting and never relaxing. It overwhelms me, and I retreat back to the mayhem where I feel the safest. The friends that matter most to me are the ones who are able to leave their door open and let the warmth pour out. They keep a light in the window so that I know where to find them. But, most importantly, when I go missing for a few years they track me down to bring me back inside. They remind me that there is nothing wrong with being out in the cold, because someone has to be watching out there, and reassure me that they’re keeping things warm for when I’m ready to come in. They are never offended when I can’t follow them back, and I know they’ll try again in a few months. Sometimes I wonder if those friends know how much they mean to me, but I doubt it; telling them is one of those interpersonal skills that I’m not very good at. This week there was a solar eclipse over Australia. My scientist boyfriend was a bit more excited about it than I was, and spent the night before making a gadget to safely watch it with. I sat there, politely bewildered, and let him go for it. I have a fairly consistent track record with eclipses. If I remember they are occurring and make the effort to leave my house to look, without fail the eclipse will be completely obscured by clouds. Whenever I forget about them, the sky is perfectly clear and viewing is easy. I would say this applies to anything interesting occurring in space, but I have been able to spot the space station twice and several people have attempted to point out various comets to me, so the rule isn’t firm. When I lose a lunar eclipse to clouds, it’s irritating. They tend to occur when it’s cold and I don’t want to be awake. But a solar eclipse? This was happily a different story. After I dragged myself out of bed and saw my boyfriend sitting forlornly on the floor with his gadget, I realised the eclipse was already happening. He complained about the cloud cover and how it was difficult it was to get an image of the eclipse. There was a lot of science that I didn’t understand, but I did work out that he wasn’t terribly pleased. Curious about how dire the cloud situation was, I wandered over to the window and looked up. As he sat there telling me about the dangers of looking directly at a solar eclipse, I stood there happily watching it. The cloud cover was so thick that my eyes had no trouble adjusting to the light, but it was still bright enough that I could see what was happening clearly. The clouds thinned slightly so I put on my sunglasses. It didn’t feel all that dangerous. As the eclipse progressed we alternated positions. When the cloud cover thinned I wandered off and he raced back to the window, gadget at the ready. As the cloud cover thickened he gave up and I resumed watching with my sunglasses. They’re cheap and nasty, but they seemed to be doing the job. Sometimes, knowing precious little about science is a benefit.